Ever since I have had my ostomy, I have tried my best to hide it so that I can continue to wear the clothes that I am used to wearing. Before my surgery, I always wore form fitting tops and dresses. I have found with my ostomy, wearing these types of outfits are forbidden, for now at least. In the beginning, I would cry because none of my clothes fit right. I have learned since July what clothes are right and what clothes are wrong, through exhausting trial and error. 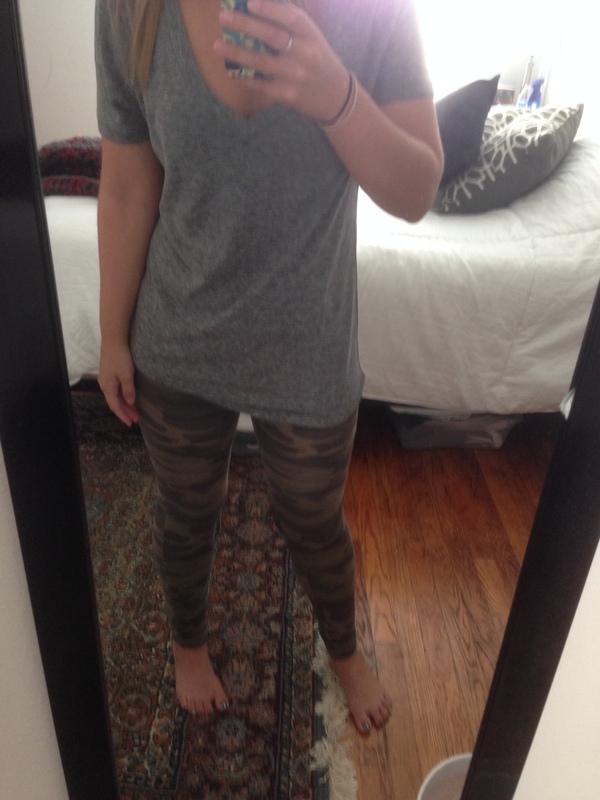 I thought it would be a good idea to share some of my outfit choices throughout my time with my ostomy, so that other girls can look to this page for some inspiration. Now that my swelling is going down, I can wear some of my old shirts and dresses, but I always have a bigger sweater/shirt to put over top just in case I feel people staring at me! Have tons and tons of leggings and yoga pants in your closet. As well as baggy t’s in all different colors, especially black. Accessorize with scarves worn longer to cover the outline of your pouch. Don’t push yourself to wear jeans too early, they push down your swelling and are super uncomfortable. If you have any pictures that include great fashion ideas for ostomies, send them to companionibd@gmail.com. And don’t forget to check out our website! www.companionibd.wordpress.com. Perfect signature ostomy outfit. 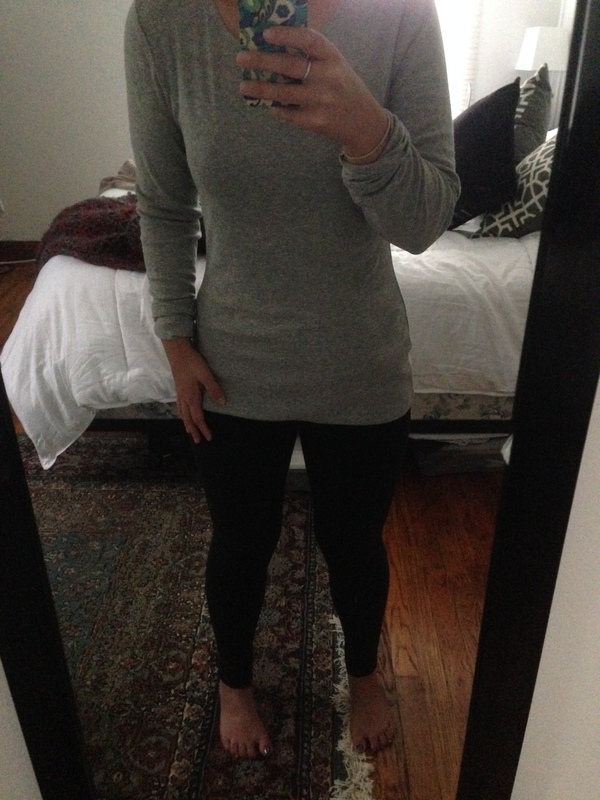 Black leggings, loose fitting grey t underneath and long sleeve loose fitting black t over top. Both from Old Navy. 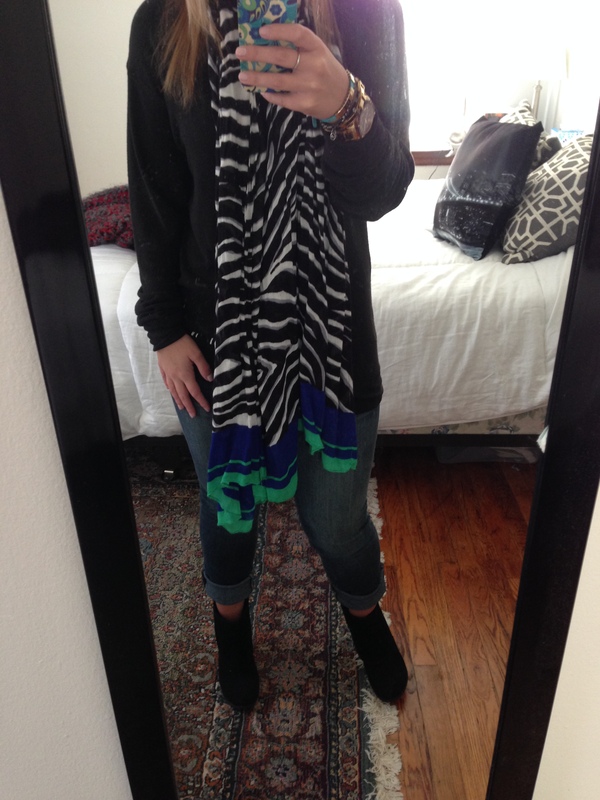 Scarf from Charlotte Russe. 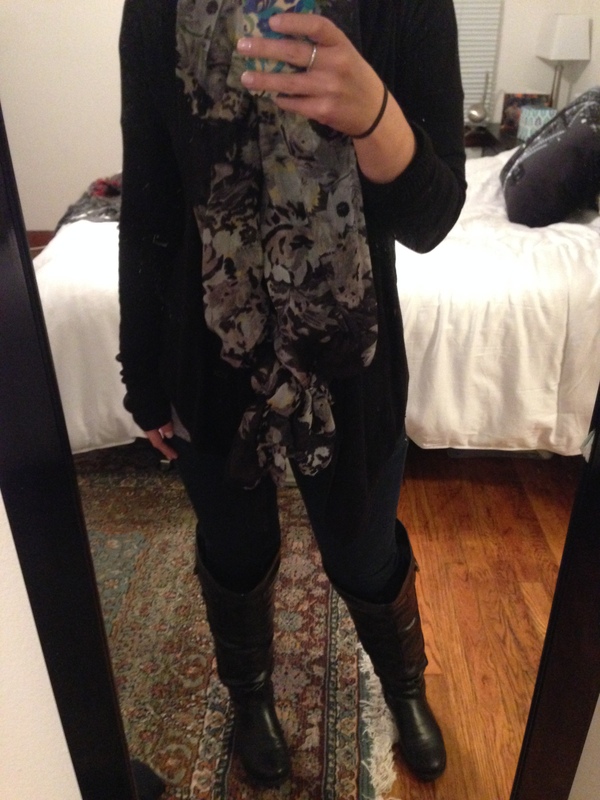 Out to dinner outfit! I have jeans on, but beware of wearing jeans too early with an ostomy. 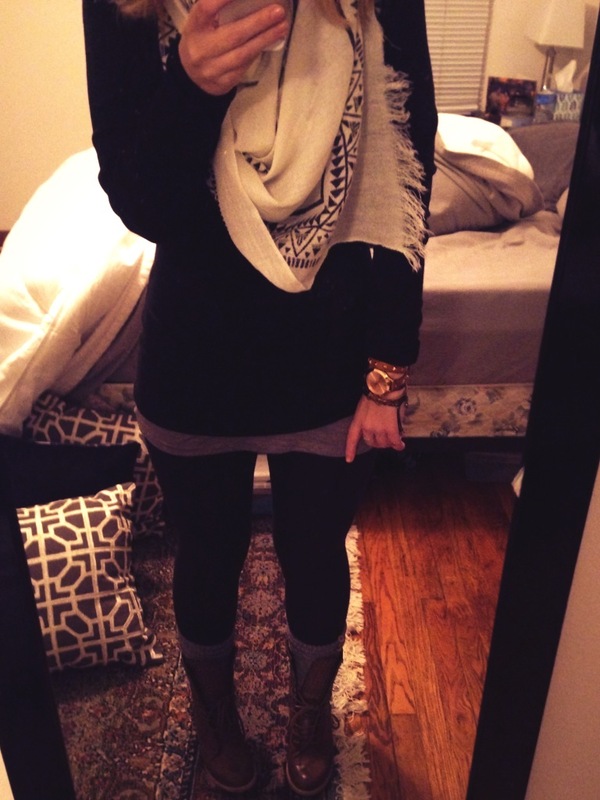 Black oversized sweater with long scarf. Black t-shirt, black sweater and black leggings. Also a scarf worn longer to cover any trace of my ostomy. 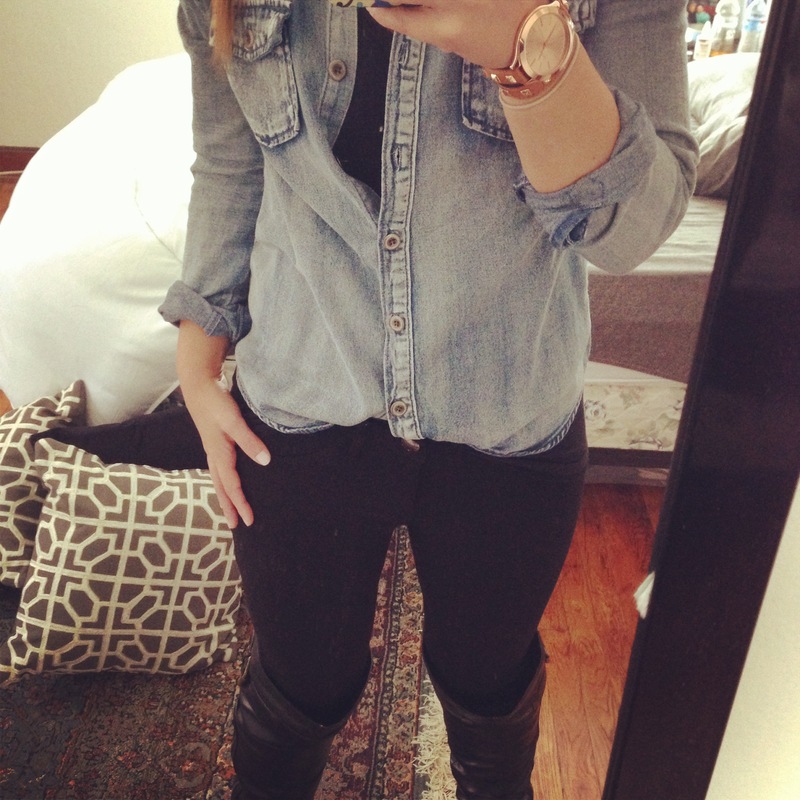 This denim button up is one of my favorite go-to’s. Any larger button up shirt works great for covering ostomies. Big, comfy sweater with black leggings. 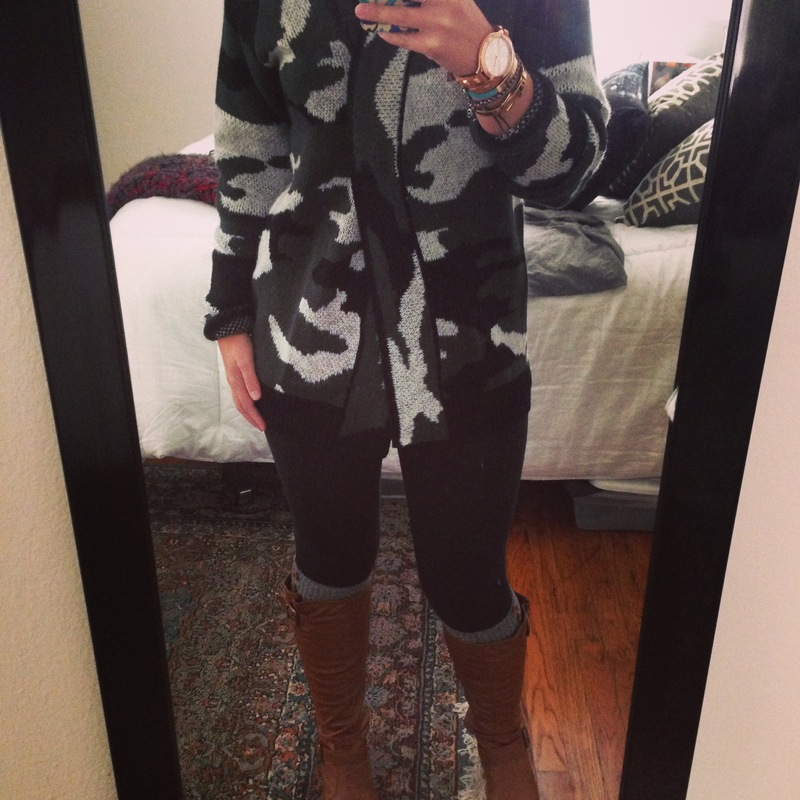 Leggings with knee socks and boots, draws attention to your feet instead of your midsection! 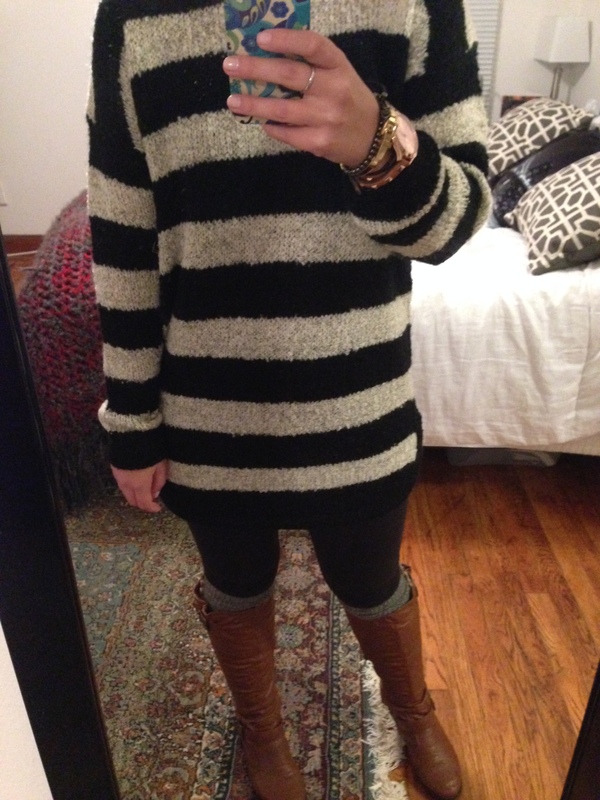 Oversized sweater and loose fitting T, my go to for fall. 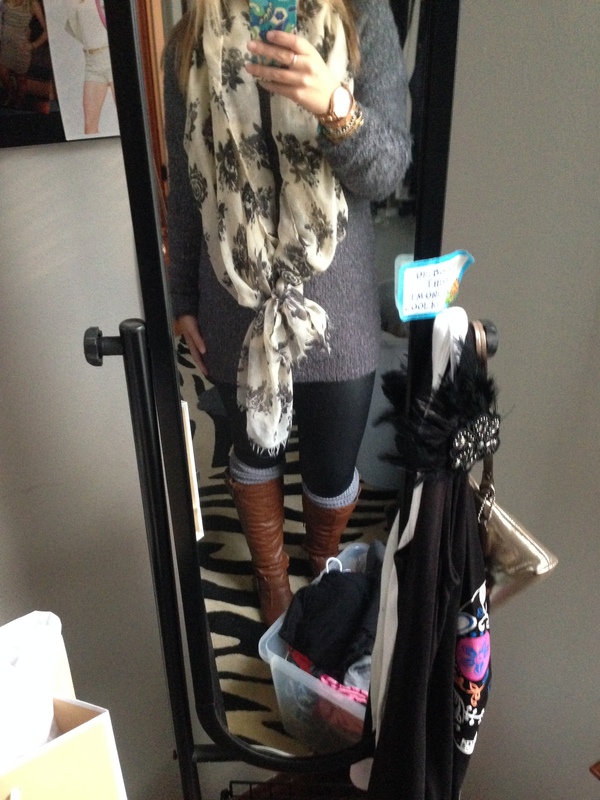 Sweater, scarf and leggings with knee socks and brown boots. Ostomy is invisible. Long sleeve loose fitting T from Old Navy. Leggings from Aerie. Easy and comfortable! A great outfit for the first day of true fall weather. 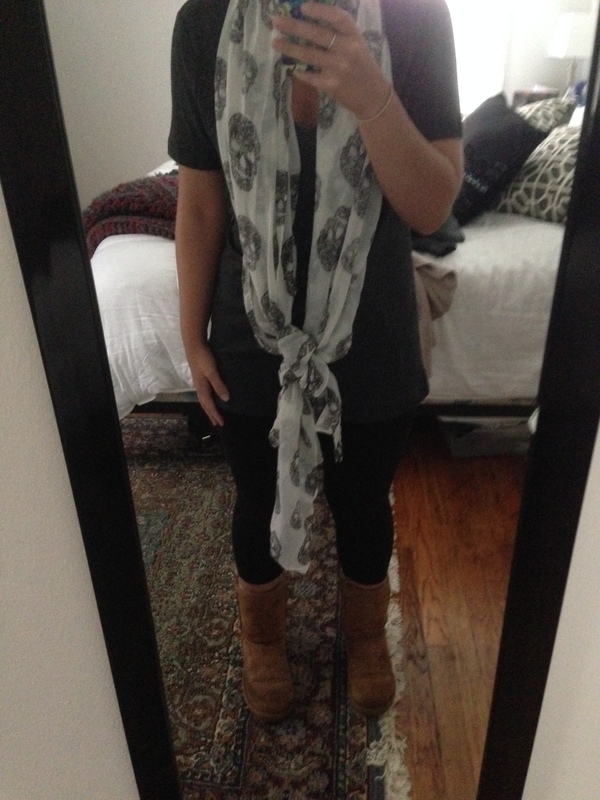 Another loose T from Old Navy, black leggings and a scarf. Scarves are so great because they truly hide any trace of an ostomy. I’m all for the camo craze. Luckily, I found some in legging form! A necessity for ostomy! Jeans and a baggy T for the first time. Be careful of wearing jeans too early after a surgery. They can be tight and squeeze around your incisions. 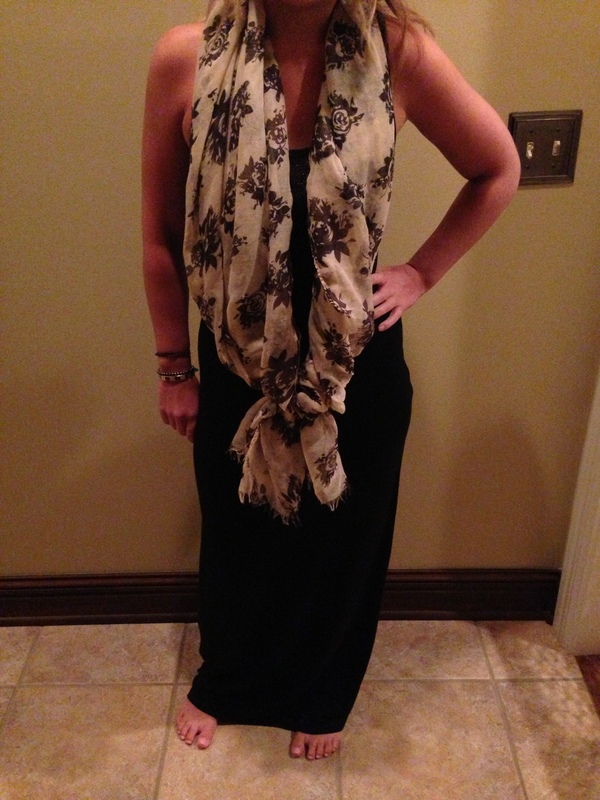 Maxi dresses and scarves are a MUST have. 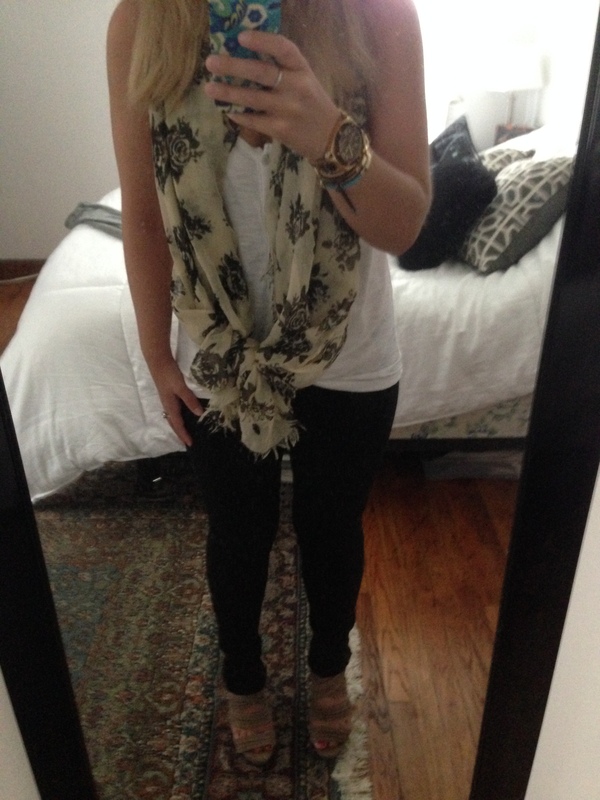 Scarves can be worn longer to cover your pouch when your stomach is a little swollen. Maxi dresses (loose fit) are great, especially in black. Great for summer/spring. Baggy tank from American Eagle, wedges, and pleather leggings. Once again, pleather leggings are so in for fall and winter and leggings are a definite for ostomy wearers. The band is elastic and can go over your swelling. Tight dresses are possible! They are great in black. I wear this dress ALL the time. The tight material presses my ostomy down in a comfortable way and the black makes it impossible to see. You can put a scarf over this kind of dress. I also put sweaters on top to make it look like a skirt, baggy t’s or button ups work well too. Black jeggings. Great fit and loose around your swelling. A scarf again with a baggy tank. If you want to tuck your tank into your pants a little you can, it helps hide your pouch better. Just make sure you’re wearing a smaller one and don’t let it get too full! 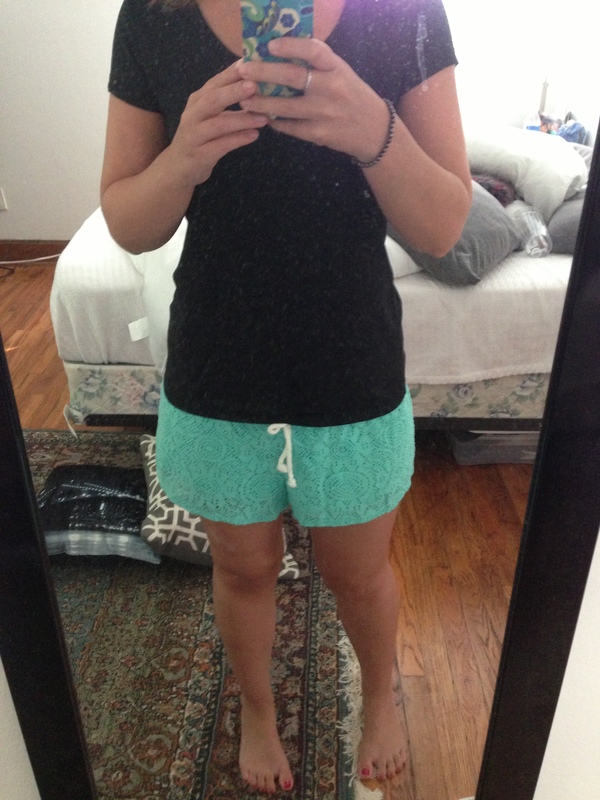 Baggy black T with elastic waste shorts from Aerie. Make sure you’re buying shirts a size up from your normal. Have a lot of black ones to choose from, black hides the pouch the best. 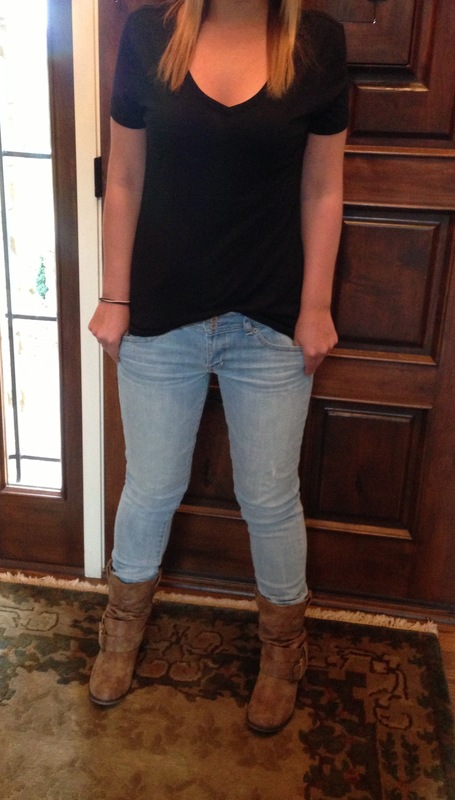 Another baggy black T with jeggings. Forever 21, H&M and Old Navy have great t-shirt options for really cheap. Make sure you’re buying a size up! 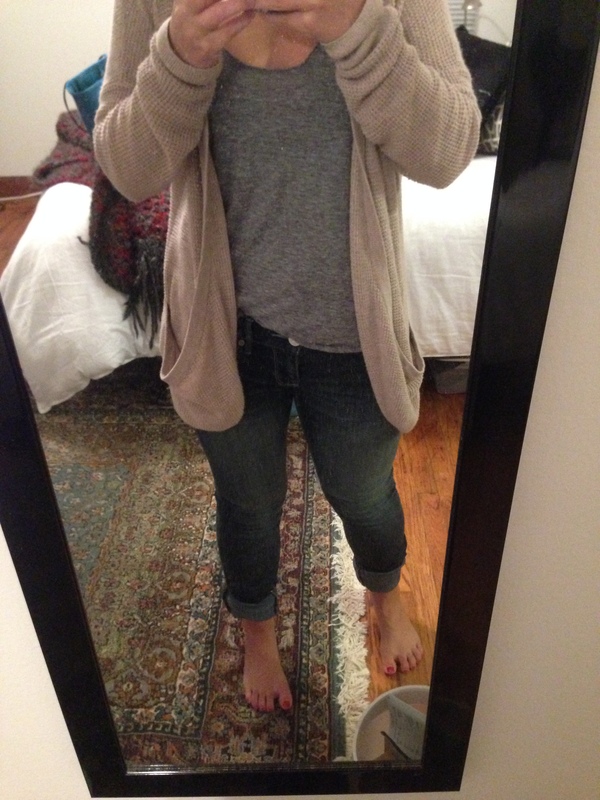 Baggy tank from Forever 21, jeggings and a sweater is a great option for Ostomies. You can wrap your sweater around the bottom half of your stomach, completely hiding any trace of an ostomy. Have a lot in your closet for upcoming fall. I also was able to tuck my tank in to my jeans with the bottom of my pouch included. Remember, don’t push yourself to wear jeans too early. how do you keep your jpouch healthy?